ALSO: Update on Dustin Brown adjusting to having to wear a knee brace; Defenseman Alec Martinez could become left wing Alec Martinez; Anze Kopitar makes a young man’s wish come true, and; in an audio interview, Willie Mitchell discusses hitting and fighting in the National Hockey League. Los Angeles Kings center Anze Kopitar (left), with 18-year-old Tyler Fithian, a leukemia patient whose wish to skate with Kopitar was granted by the Make-A-Wish Foundation of Greater Los Angeles, on October 23. LOS ANGELES AND EL SEGUNDO, CA — Entering tonight’s game against the Phoenix Coyotes at Staples Center in Los Angeles (7:30 PM PDT; televised locally on Fox Sports West), the Los Angeles Kings are a disappointing 6-4-0 to start the season, good for twelve points. That ranks them a lowly fifth in the seven-team Pacific Division, and seventh in the Western Conference. Although it is way too early in the season to be overly concerned, to this point in the season, inconsistent play has been a rather glaring issue for the Kings, and it has shown up mostly in their inability to generate a forecheck with any semblance of regularity, as was evident in a 3-2 loss to the Calgary Flames at Staples Center on October 21. Indeed, even though the Kings took too many penalties and gave up three power play goals, their problems extended beyond their poor penalty-killing that night. 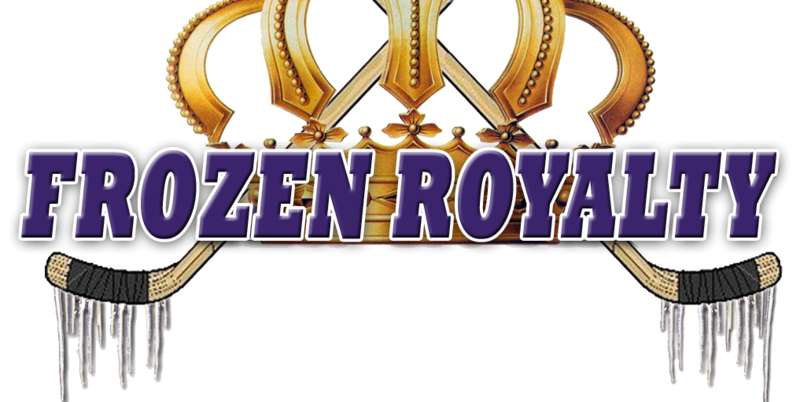 The forecheck seems to be the key to just about everything that makes the Kings successful. “We need to have a good forecheck, be fast on the forecheck, and bypass pressure,” said veteran defenseman Willie Mitchell. But the forecheck really begins 200 feet away, behind a team’s own net, believe it or not. After all, the forwards are generally not going to be able to chase down loose pucks deep in the attacking zone, beating the opposing team’s defensemen to the loose puck, if their own defensemen can’t get them the puck in a position where they can generate speed through the neutral zone. In other words, the Kings still need a lot of work on closing the gaps between the forwards and defensemen on their breakout plays, and on dump-ins in the attacking zone. Mitchell indicated that some players might be relying too much on the fact that the Kings are considered to be one of the top teams in the National Hockey League. One detail that is having a negative impact on the Kings, and stands out like the proverbial sore thumb, is that none of team’s centers has scored a goal in their first ten games of the season, a fact that head coach Darryl Sutter is now expressing concern about. “Our centermen have over ten games in—I bet, in the history of the game, there’s no team that’s 6-4, and their center men haven’t scored a goal yet,” he lamented. Although Sutter pointed to his centers specifically, he indicated that their struggles are not theirs alone. Martinez Trying On New Hat? Defenseman Alec Martinez (nicknamed “Marty”), who has been in and out of the lineup since last season, was paired in the team’s October 23 practice with fellow healthy scratch, defenseman Keaton Ellerby. Knowing that Martinez did not skate a single shift on left wing during practice, reporters asked Sutter about his reasons for the alleged experiment. “Someone has to play left wing,” Sutter shrugged. As for when one might expect to see Martinez actually move up to left wing in practice, anything is possible, so stay tuned. During the second round of the 2013 Stanley Cup Playoffs against the San Jose Sharks, Brown tore the posterior cruciate ligament in his knee. No surgery was required, and he rehabilitated the knee during the off-season. But Brown must now wear a knee brace. He is one of those players who absolutely cannot stand to wear extra gear, and the first brace he had really bothered him. But now, it appears he has found one that he can live with. Brown will wear the brace throughout this season, at least. 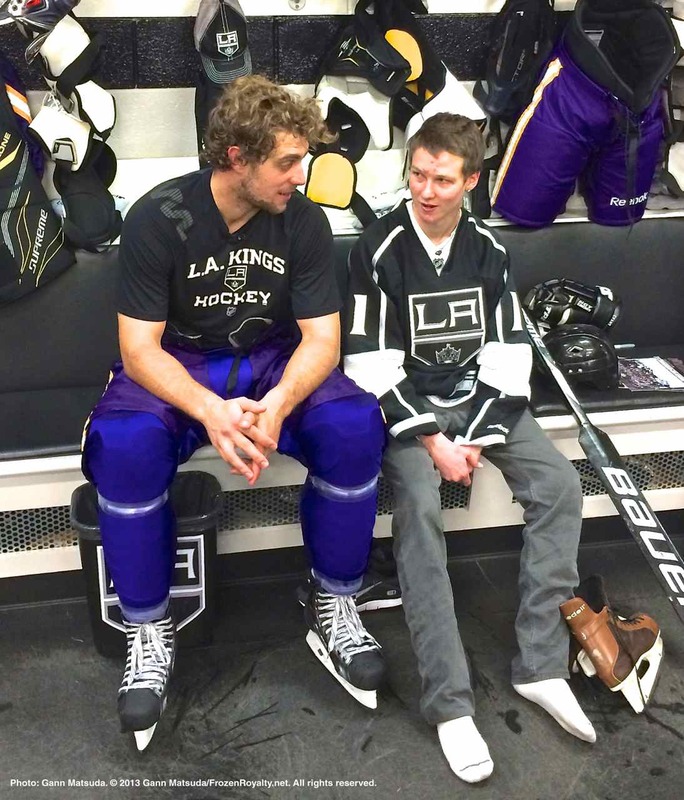 After Wednesday’s practice, 18-year-old Tyler Fithian of Lomita, California, had his wish fulfilled, when he got to skate with Kopitar, thanks to the Kings and the Make-A-Wish Foundation of Greater Los Angeles (see photo above). Prior to the skate, which included former Kings forwards and current color commentators Daryl Evans and Jim Fox, Fithian and his family got to tour the Kings dressing room, and after the skate, he had a chance to sit and chat with Kopitar in the dressing room (see photo). Fithan, who is suffering from acute lymphoblastic leukemia, will also drop the puck for the ceremonial face-off prior to tonight’s game against the Coyotes. Reblogged this on Hockey Smashdown.